This week I decided to use some leftover enchilada sauce to whip up some vegetarian enchiladas for dinner. I’d been craving mexican and wanted to switch it up from our regular burritos. Little did I know that it would be my best recipe creation yet! 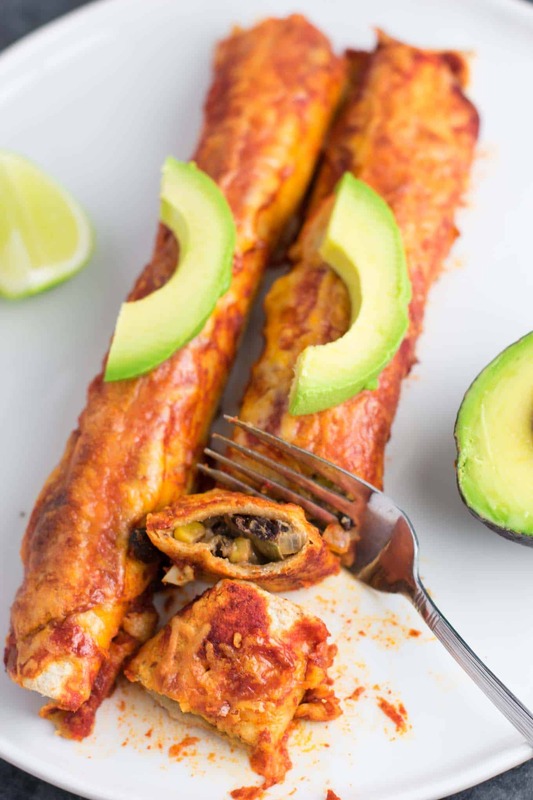 I named these the best ever veggie enchiladas, because…well.. they are the BEST enchiladas I’ve ever eaten. I cannot wait for you to try these! 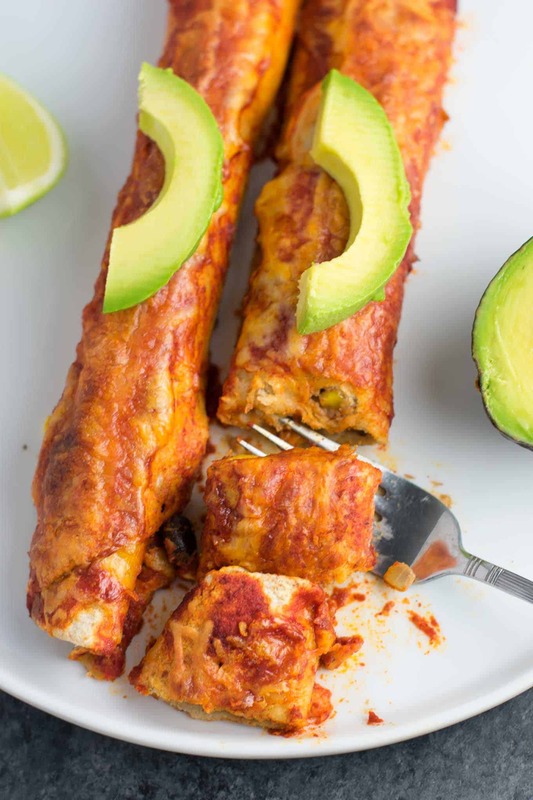 These vegetarian enchiladas have now become a staple in our house, and we fight over the leftovers! Heck, the last time I made these my toddler surprised me by eating half of a whole enchilada and stealing more off of our plates. Now if a two year old will even eat it, you know it’s gotta be good! First, cook your garlic, onion, and bell pepper until the onion is translucent. Add in frozen corn and cook a few more minutes while it defrosts. 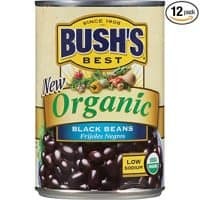 Next, add beans, cream cheese, mexican cheese, spices, and fresh lime juice. Keep stirring and cooking while the flavors all start to marry together. Salt and pepper to taste and you are ready to start rolling your enchiladas! Tip for easier enchilada rolling: nuke your tortillas in the microwave until they are warm (not hot). If you try to roll cold tortillas, they often break. Warming them up first makes the process a lot easier! 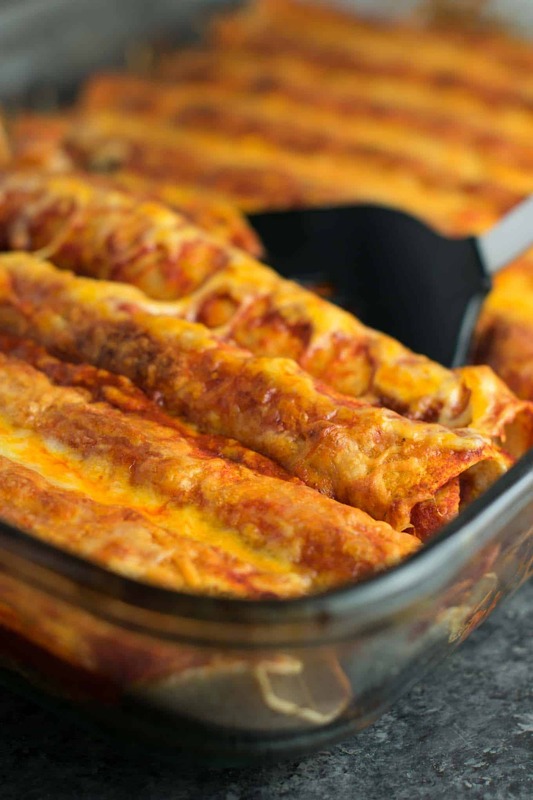 Once you have rolled your enchiladas, place them in a large baking dish. Pour the enchilada sauce evenly over them, then top with the rest of your mexican cheese and they are ready to bake! The secret to the CRAZY awesome flavor of these enchiladas is in the filling! I used cream cheese and a special blend of spices with a hit of fresh lime juice for that extra kick. Do not leave out the lime juice! It adds so much fresh flavor. My last tip for the best flavor, is to top your enchiladas once you are ready to eat them. Squeeze extra fresh lime juice over the tops and serve with fresh avocado with each bite. I have been known to squeeze a whole lime over the top of my two enchiladas! 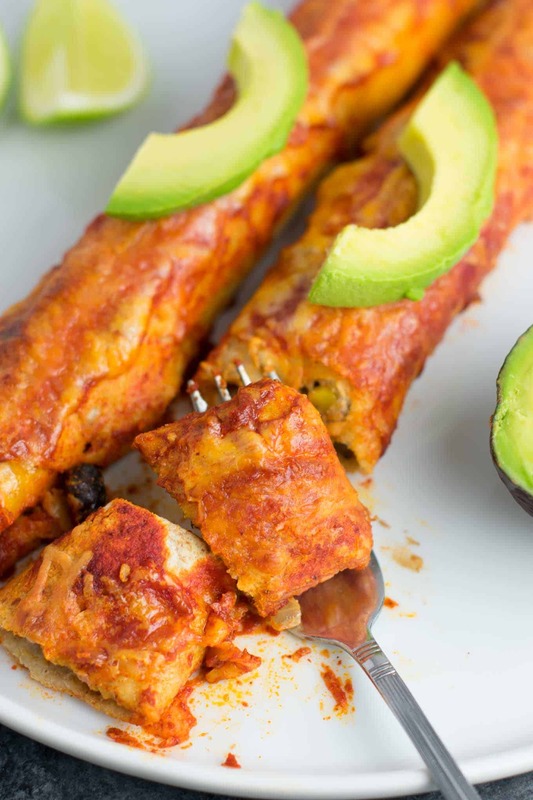 The lime adds so much flavor, and the creamy avocado contrasts to the smoky flavor of the enchiladas and it will knock your socks off! 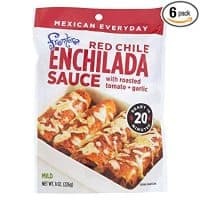 I just used store bought enchilada sauce (this is the one I buy) , but you could make your own homemade enchilada sauce if you wanted! This post contains an affiliate link to the enchilada sauce that I use. If you purchase through this link, I get a small commission to help run this blog, at no additional cost to you. Once our enchiladas were crispy, we served them topped with more fresh lime juice and creamy sliced avocado. It was so good I literally licked my plate (no shame!) and we were scraping pieces out of the pan. I could eat these forever and never tire of how much flavor they have. I promise if you are new to meatless eating, you will not even miss the meat! I’ve been dreaming about the leftovers all day and am already planning to make these again next week! Don’t just take my word for how good these are! Here are just a few of the rave reviews these enchiladas have received so far. From Alicia: “My boyfriend recently became vegetarian and I’ve been searching for some good vegetarian recipes. Hungry for more vegetarian mexican recipes? Want to save this recipe for later on your Pinterest board? Click HERE to pin this recipe! These black bean and veggie enchiladas are the most delicious vegetarian enchiladas you will ever eat! Bake at 350 for 20-25 minutes, or until cheese becomes slightly crispy (turn up the heat if necessary towards the end for desired crisp) I broil on low the last couple of minutes to make the cheese browned, but if you do this be sure to watch closely so that you don't burn it. These are the best enchiladas I’ve ever eaten! I’m a new vegetarian and desperately seeking delicious recipes. Thanks so much! So glad you liked them Sarah! They are so addictive! Can I add chicken? 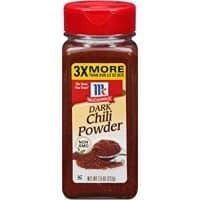 Would I add more of the ingredients if I added chicken? I added chicken instead of beans and they were fabulous! 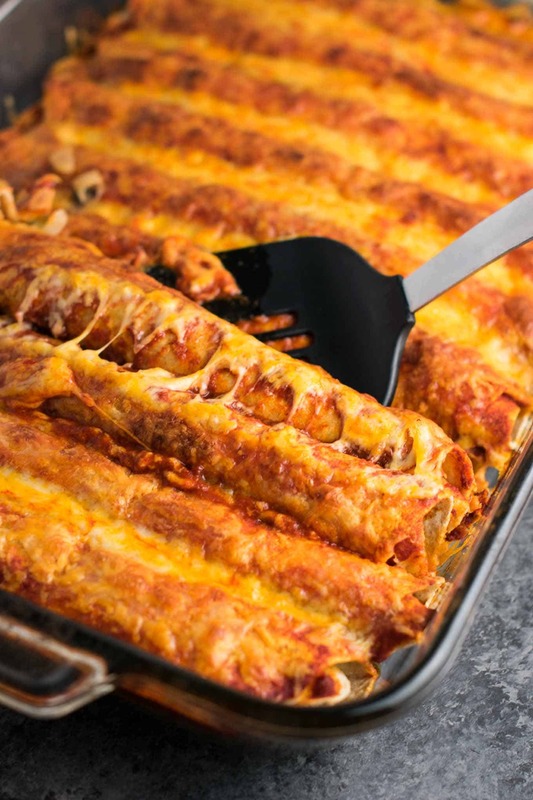 I haven’t tried these yet, but every time I attempt enchiladas at home, the tortillas end up soggy. Any tips or advice on how to remedy this??? 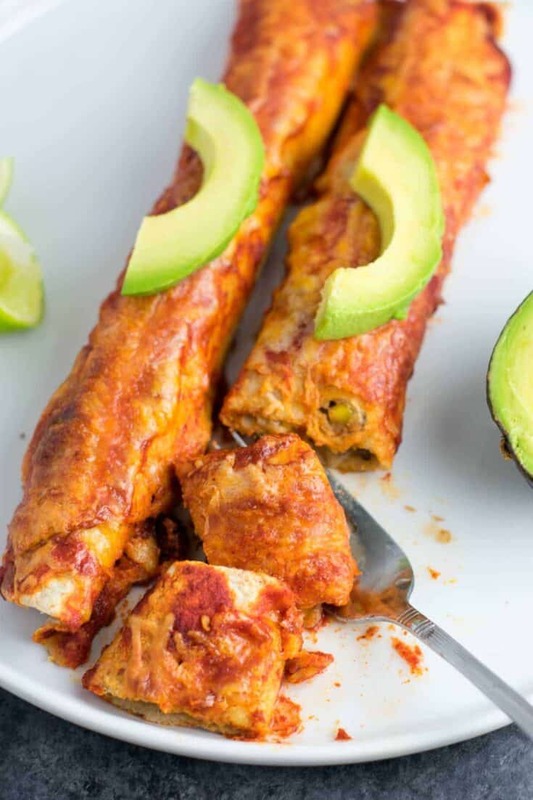 What I do to avoid this is make sure the filling isn’t too runny and I only use enough enchilada sauce to coat it on the tops without being overwhelming. 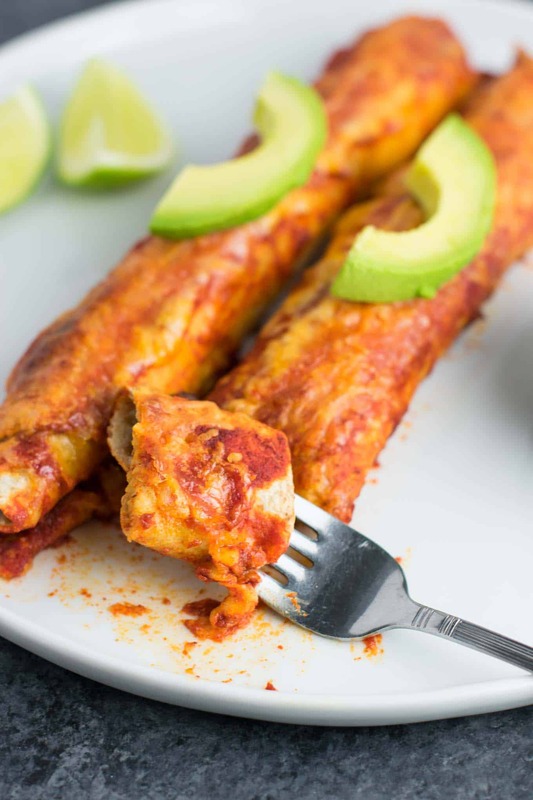 These enchiladas aren’t soggy and get crispy edges – I love them! Another way to avoid the soggy tortilla is to do the old fashioned cooking of the tortilla prior to rolling. Heat oil until hot, Flash cook the tortilla about 30 seconds, or less on each side and drain prior to adding filling & covering with sauce. It adds calories but I’ve found it does help to keep the tortilla from getting soggy. Made these for dinner tonight. They were amazing! So glad you liked them Bonnie! Hi Joy. Do I cover the enchiladas with foil or just as is? I didn’t bake them with foil on so I don’t think that is necessary. I hope everybody enjoys them!